Farm animals like the cow are the only source of livelihood for farmers, and having all four limbs functional is of at most importance. Ganga, is a cow who was rescued from a slaughter house by Durga Prasad Gaushalaa (the shelter home) at Behrod town of Rajasthan, with her right hind limb cut - But thanks to &apos;Krishna Limb&apos; an NGO that develops prosthetic legs for such animals, Ganga has taken really well to her new leg and is living a healthy life. Image: Dr. Tapesh and his team working on fitting a prosthetic limb on Ganga and Ganga after after the prosthetic limb. Contribute INR 5000/- to this campaign and you enable &apos;Krishna Limb&apos; to gift an animal a second life. 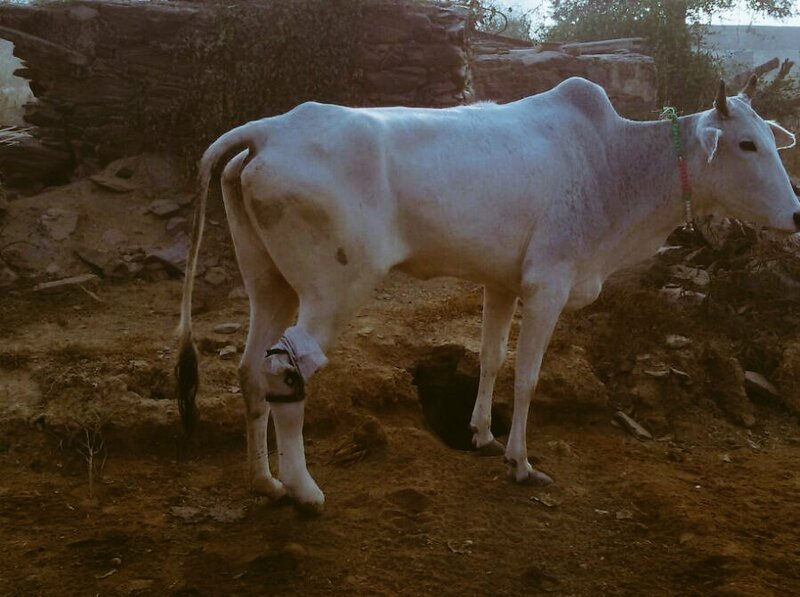 Through this campaign &apos;Krishna Limb&apos; can impact the lives of 30 such animals ACROSS INDIA. &apos;Krishna Limb&apos;, a Jaipur based organization, helps disabled animals walk and run FOR FREE. Dr. Tapesh Mathur is the man behind ‘Krishna Limb’. He is a pioneer in India in making prosthetics for animals. Krishna Limb was started by Dr Tapesh Mathur and his wife Dr Shipra Mathur in a bid to bring relief and rehabilitate animals who have found themselves disabled. We implant Krishna Prosthetic Limb to Amputee Animal, treat domestic and pet animals, organize camps, launch campaigns for Bird Safety, Surgery, Care for Accidental Animals, invite volunteers to help support the cause best way. We have also got a lot of inquiries from across India for many other species as well such as the horses, dogs, goats, cats etc. Dr Mathur was posted at Jaipur Polyclinic, here he would see animals who had lost limbs to accidents and those who were amputates. He used to perform surgeries on them and send them home. He saw their pain and realised that rehabilitation was necessary for these animals. Rather than just helping them recuperate from their injuries, he realised that prosthetic limbs would help them lead more normal, independent lives. The drive to make these prosthetic limbs became a reality when he was posted at the Rural Polyclinic in Jaipur which was a govt rehabilitation centre also for abandoned, stray and accidental cattle. The first limb was made for a calf named Krishna and was the beginning of the Krishna Limb story! “They could not walk or lead normal lives. Their owners wouldn’t have the means to take care of invalid animals. This thought disturbed me for many years and I wished to do something for the animals. That is how I started researching the subject of prosthetics for animals,” says Dr. Tapesh. With vast experience of Working at Rural and Urban Polyclinics, Department of Animal Husbandry, Govt of Rajasthan, Dr Tapesh is now known for his pioneering work of Prosthetics for Animals which has been awarded and recognized by scientific forum. 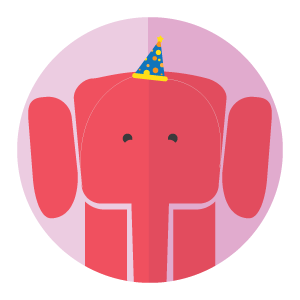 Experience into surgery of large and small animals he now enjoys serving disabled animals with amputated limb. A small room in Dr. Tapesh’s home became his workshop. He researched how prosthetics are made for humans and how they can be made for animals. 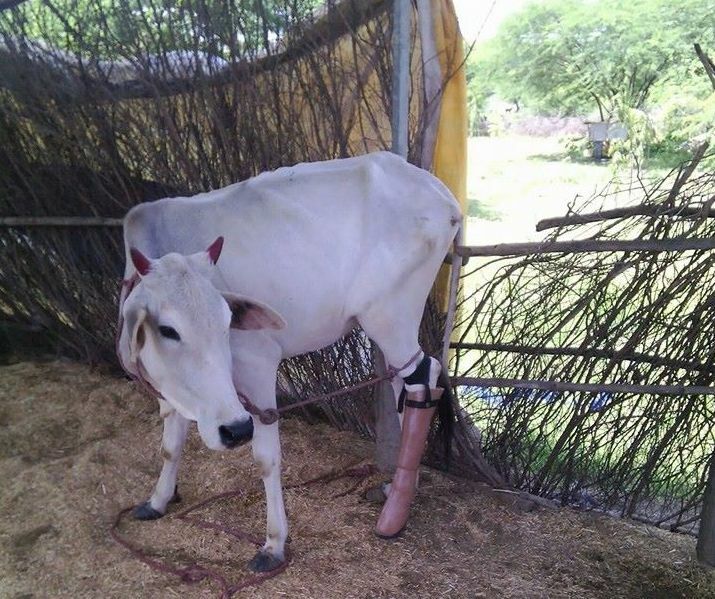 Pen Media Foundation Society supports Dr Tapesh who has installed Limbs on more than 3 dozen cows and 2 dogs too. He has won many awards from various reputed institutions for the work he does on animals. 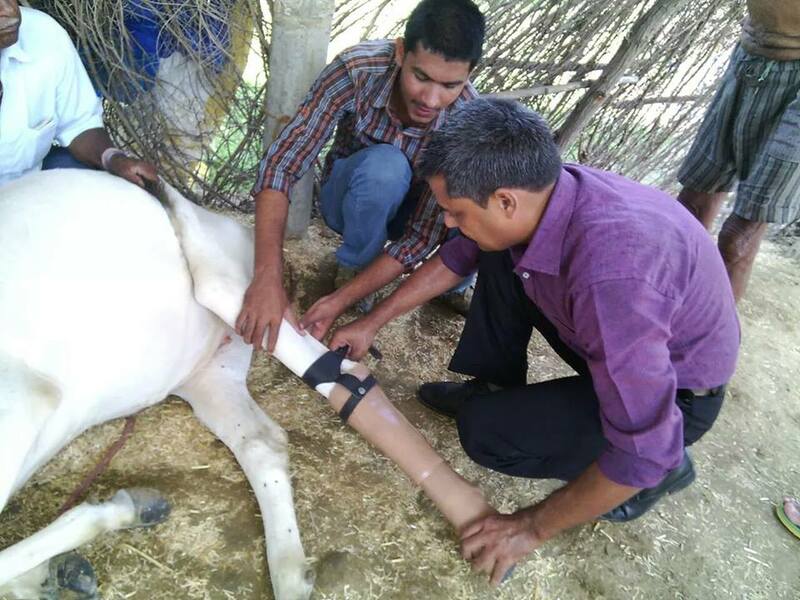 Image: Dr. Tapesh and his team working on fitting a prosthetic limb on a calf. We are raising funds in order to manufacture prosthetic limbs for cattle. It costs approx. INR 5000/- to make a single prosthetic. 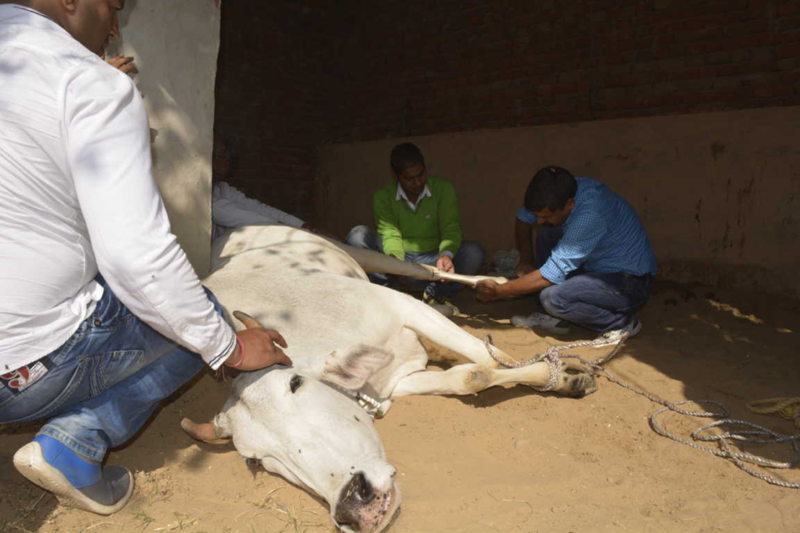 The physiotherapy sessions that the animal is put through to accept the leg is done completely pro bono. A contribution of INR 5000/- by you enables Dr. Tapesh and his team to help ONE maimed animal, to not only walk but RUN. The COST BREAKUP for a prosthetic is highlighted below. The above cost excludes the travelling charges, to and fro that they manage on their own. Usually travel is required to be done twice. In 2014, he received the Gold Medal for Research and Innovation by the Panel of Jury at International Symposium and 38th Annual Congress on Surgery, organized by Rajasthan University of Veterinary and Animal Sciences, Bikaner. In 2015, at 39th National Conference of Indian Society of Veterinary Surgery, Srinagar, he was awarded another Gold medal in the &apos;Best Field Veterinarian Award&apos; category for his work on Krishna Limb as he presented a scientific study on his research and innovation. Thank you for your contribution. You will receive a thank you email from Krishna Limb. Thank you for your generosity. As a token of appreciation, you will receive a digital postcard and a Facebook shout out from Krishna Limb. Thank you for your contribution. As a token of appreciation, you will receive a poster and a thank you email from Krishna Limb. Thank you for your contribution. As a token of appreciation, you will receive a thank you call, email and a digital postcard from Krishna Limb. Thank you for your generosity. You will receive a thank you email, call and a digital postcard from Krishna Limb. Thank you for your contribution. You shall receive a video message from the founder. You will also receive an email and a digital postcard from Krishna Limb. Thank you for your generosity. 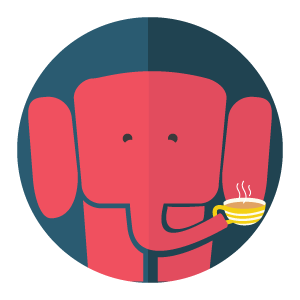 As a token of appreciation you shall get a chance to have a video chat with the founder. You will also receive an email and a poster from Krishna Limb.